The last issue of the Norwegian science education magazine "Naturfag" (equivalent to "School science") has several articles on food previously posted here on fooducation. The magazine is in Norwegian and free for download. "Deciphering an old preserves recipe"
"Leavens in cookies - theory and practice"
The latter also made it into the news section of "Nysgjerrigper", a science knowledge project from the Norwegian Research Council. Of course there are several other interesting topics in the issue as well, such as "Gingerbread house architecture" "Catch sight of and predict the northern light" and more. Last year, I had the pleasure to act as a co-supervisor for two students at in their final project for the Food and beverage management study at the University of Stavanger. The focus was low-temperature cooking. The students, Eirik Nestavoll and Martin M. Stokkan (both chefs), attended this as a continuing professional development study. The aim of their experimentally angled final project was whether "new cooking methods" might give economic gain to hotels. Pastry chef Aidan Brooks has posted the invitation to join in on episode #18 of "They go really well together" (TGRWT). The idea is that foods with one or more flavour compounds in common will taste well in combination; the concept of flavour pairing. This month's ingredients are plum and blue cheese. I've found that simple dishes such as milk shakes, smoothies and ice cream (this post) provide excellent matrixes for testing flavour pairings. Things are kept simple allowing for the pure flavours to come out, not being swamped by lot of (distracting) flavours from other ingredients. As such, milk and/or cream pose a good base. So this time, I went for a very simple straightforward recipe for soft serve ice cream. At the same time, it gave me the opportunity to test our new Bamix immersion blender (a common blender or smoothie machine will probably work well too). Culinary precisions, part 3:3. Students as "culinary mythbusters"
Among the challenges in science education are creating quality inquiry-based teaching methods as well as promoting students' argumentation skills. Both these topics might be seen as parts of what goes as "the nature of science". In this last post of three, I argue that statements about food and cooking might be an excellent starting point for learning argumentation as well as inquiry, as well as content knowledge, while dealing with real-life problems with meaningful purposes. In part 1, I suggest that there might be a good idea to collect statements about food and cooking (culinary precisions) in an open database, whereas part 2 argues for the use of argumentation patterns in the analysis of such statements. For explanation of the term "culinary precisions", see part 1. 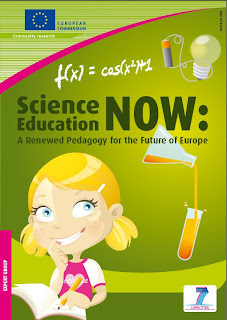 There is abundant literature, as well as political signals, that point to the need for development of fresh approaches to science education, not the least because of an alarmingly low interest in science and mathematics. Furthermore, the last years have seen a need to shift towards a science education in which "the nature of science" is taught as well as content knowledge; students at all levels should gain experience with scientific inquiry, argumentation etc. There are of course numerous ways this challenge might be taken on. One problem when it comes to inquiry and argumentation is to find experiments, topics and investigations which are open-ended real-life problems. It's not very exciting to do "inquiry" if you know that the teacher has got the answer in his/her drawer. But what if the thing you were analysing, discussing and experimenting was a real problem? And even more, that others, such as a scientist or the general public, would be interested in the result you came up with? Such scenarios do exist (such as sustain.no, which in fact is a database), but I feel pretty confident that there is need for a range of such approaches, covering various topics. Statements on what to do, how to do it, and occasionally why to do so, are abundant in the world of food and cooking. This is the second post of three, and deals with a rationale for analysing such statements. The third post will deal with the potential of using this for educational purposes, both in science and food disciplines. In the first post, I wished for, and tried to give good reasons for building a database of statements on food and cooking (culinary precisions). For an introduction and definition of culinary precisions, see part 1. Culinary precisions part 3:3. Students as "culinary mythbusters"
"sprinkle lemon juice on sliced apples/pears, and the fruit will not go brown"
"you should avoid piercing meat as the juice will flow out resulting in a drier piece of meat"
"you should cut off the ends of a roast before putting it in the oven"
"when canning fruit in glass jars, the jar must be stored upside down"
Some precisions contain reason(s) for why one should follow them, others give a consequence that might occur if you don't follow the advice given. During a course on argumentation in science education, I realised that culinary precisions might indeed be considered to be claims. Occasionally, these claims have some data or warrants to explain why you should follow the advice given, and sometimes they don't (first case: "if you do A, B will happen", second case: "do this"). Hence, we are in the domain of arguments. Is it really true that you shouldn't rinse, but rather brush, mushrooms? Should a steak be seared to keep the juices inside? The world of food is full of statements on how to do things, many of which are rooted in tradition. When tradition and science meet, interesting things might happen. This is the first post of three on the topic. This first part argues for an open database of such statements, including analysis. 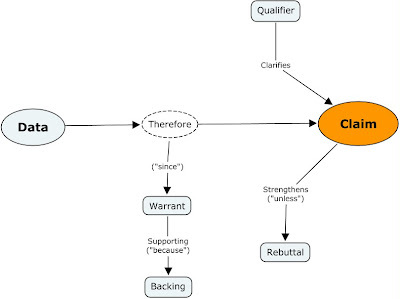 The second will deal with a rationale for analysing such statements using argumentation patterns. In the third post, I discuss the potential of using this for educational purposes, both in science and food disciplines. A short introduction for newcomers: Dealing with statements on food and cooking is among the major objectives of molecular gastronomy (MG for short, a term and field which enjoys quite a lot of debate, both in terms of its name and also because it is a field in it's infancy. There is a debate running in various channels, but discussing MG in general is not the topic in this post). As defined by Hervé This, such statements are called culinary precisions. You might just as well say "old wives' tales", "culinary proverbs", "cooking rules/advice", "know-how", "adages" or "maxims". I have no strong preferences on what words to use for this, but thus far I think "culinary precisions" does the trick and will adhere to that. 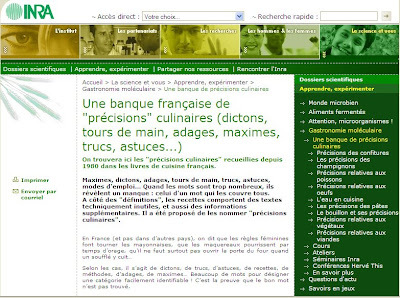 There are a few publications speaking of culinary precisions (such as these four). To my knowledge most publications are focussed on speaking of this phenomenon rather than doing a real analysis. For several reasons, this would be very interesting to follow up. I've found only one collection on the www, by Hervé This, which is in French (unfortunately I don't speak French and have to rely on automated translations). However, this collection lacks the analysis aspect. Most noteworthy is the temperature difference between the bottom and top, since the food and rocks are laid in layers. This is very interesting in terms of where to place food the next time we'll use this method. One might also exploit this to cook different foods in the same pit (i.e. meat and chicken or fish); place the meat at the bottom and place the fish directly on top of the meat. Also, note that the fish, being wrapped in foil, levels off at 110 °C. I guess this is due to the large water content in a closed package. Hence, this isn't the method if you aim at sous-vide type results. The flavour and texture is however still very good, not at all mushy. We're on our way to publish a web based teaching plan on this topic, including historical, physical science, and food related information at www.naturfag.no/mat (Norwegian national school science web pages) and www.natursekken.no. All in Norwegian (but google and babelfish make increasingly good translations). I'll post a note when it's out. During graduate studies, we often wished for a "journal of unsuccessful chemistry" for the benefit of all the failed experiments we do. What if there was a journal where we could look for the experiments we were planning, and see if someone else had tried it and failed? This is one of those stories. In my search for info on why chocolate seizes (chocolate part 1:3) and shaping chocolate (chocolate part 2:3), I came over three papers on the wetting properties of cocoa and cocoa granules. In short, they stated that if I could turn cocoa powder into a granulate rather than the fine powder it is, it might disperse more easily because it'll interact better with the water molecules. Also, I figured, it might taste better in it's dry state as it's easily wetted by the saliva in my mouth. Would it be possible for me to make my own instant cocoa, or maybe some palatable cocoa powder for sprinkling on top of dishes? If so, I could make my own blend and use quality cocoa rather than the sugar-loaded mixtures that are sold in grocery shops. Omobuwajo et al. 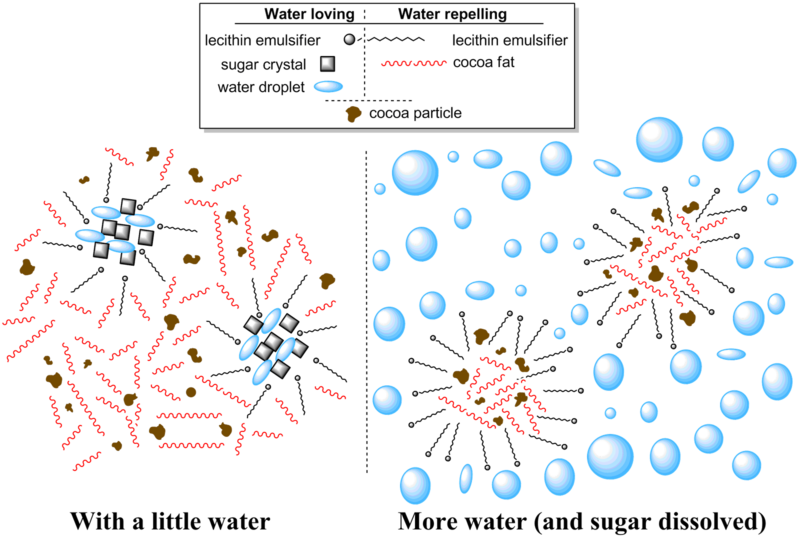 brought about an easy method of making granules that are readily wetted by water. They simply heated the cocoa powder on metal plates. No need for expensive industrial machinery and additives. They investigated the granulation related to various cocoa-to-sugar ratios and conclude that the two best instant cocoa mixes were made by rapid heating of sugar and cocoa in 3:1 and 4:1 ratios, using fine sugar (0.23 mm), giving granules of 0.18 mm size. Now, if heated metal plate = skillet on my stovetop, I might make my own instant cocoa powder, or...? A mixture of 9 g plain cocoa powder and 27 g sugar was heated in a pan on medium high heat (a little below maximum) with continuous stirring for 5 minutes. Result: yes, the cocoa is granulated (right). No, I was not able to make granules that disperse more easily in a reproducible manner (some times it was easily wetted, sometimes it wasn't). Also, the powder tasted somewhat different due to the heat treatment (surprise...), without being more palatable than pure cocoa powder mixed with sugar. Conclusion: more testing is necessary, several parameters to vary (temperature, time, stirring). This might probably work, but I don't find this interesting enough to spend more time on experimenting. Wetting by water is closely related to whether something is hydrophilic or hydrophobic. If it's hydrophilic, it loves water and wetting occurs easily; water spreads out on the surface. If it's hydrophobic, the opposite occurs, such as on Gore-Tex. Wetting is not limited to water, and other solvents also possess wetting properties. These properties are in turn closely related to the surface energy. A general rule is that media/material with similar surface energies will possess similar wetting properties. Galet et al. reported that the surface energy of cocoa powder is considerably lower than surface tension of water. Result: water and cocoa powder don't mix very well (surprise...). The bad dispersion behaviour of cocoa is caused by a number of phenomena, and one is the hydrophobic nature of cocoa, the fat content being 10–12% in cocoa powder. The mean particle size of cocoa is commonly around 16 micrometres (0.016 mm), but the size distribution is wide. The smaller the grains, the more difficult is the dispersion. 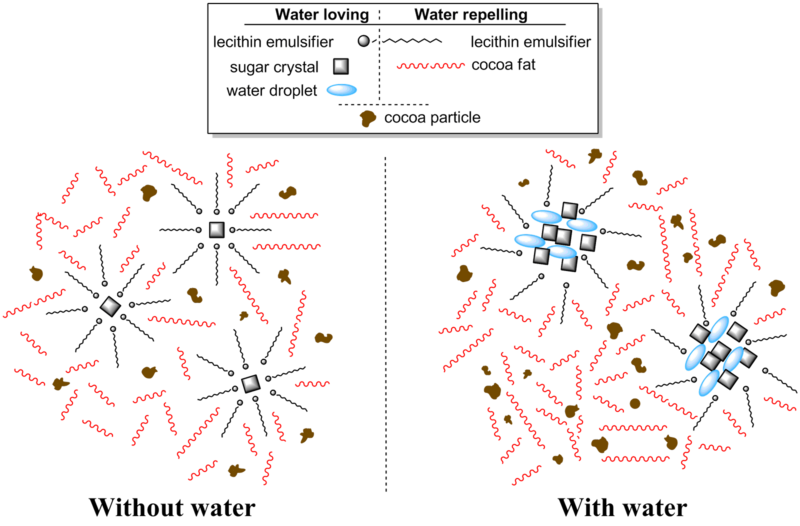 Granulating the powder (making grains of 0.02 mm - 2 mm) resulted in enhanced wetting properties. Partly, the bad dispersion properties is because of the bad flowability and the cohesive forces of the powder. The cohesion results in solid agglomerates, and the shear forces are not sufficient to break the cohesive forces between the grains. In plain words: cocoa powder lumps up in water, simply floating on top (another surprise...). A conclusion that may be drawn by this, is that liquids with lower surface tension (surface energy) than water might wet cocoa more easily. Galet concludes that liquids with lower surface energies than 40 mN/m will wet the cocoa powder, and that less than 15 mN/m will give perfect wetting. 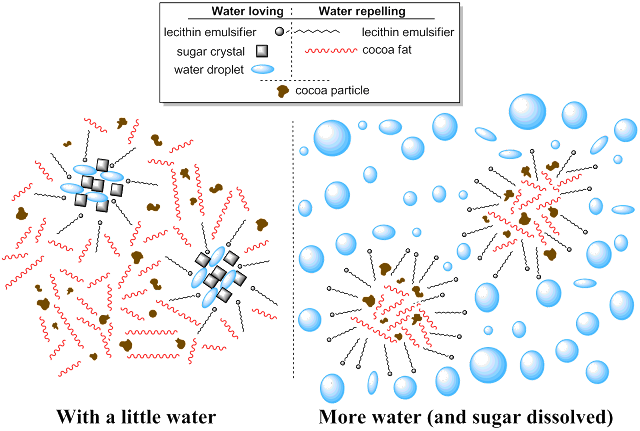 Water has surface energy 72 mN/m, not to wonder why cocoa powder and water doesn't mix well. However, alcohol (ethanol) has surface energy 22 mN/m, and a 40% ethanol in water mixture has surface energy 41 mN/m. Conclusion: making cocoa flavoured alcoholic drinks should be easier than water-based ones. Galet et al. "Improving the Dispersion Kinetics of a Cocoa Powder by Size Enlargement". Powder Tech. 2003, 130, 400-406. Galet et al. "The Wetting Behaviour and Dispersion Rate of Cocoa Powder in Water". Food Bioprod. Proc. 2004, 82, 298-303. Omobuwajo et al. "Thermal Agglomeration of Chocolate Drink Powder". J. Food. Eng. 2000, 46, 73-81. A shear thinning, or pseudoplastic, medium is one that exhibits decreased viscosity when shear stress is applied. The most common example is probably ketchup. Turn the bottle upside down, and the contents stay put. Give the bottle a knock, and annoyingly half the bottle pours out. The same phenomenon is in action when a great landslide results from just a small shaking (i.e. 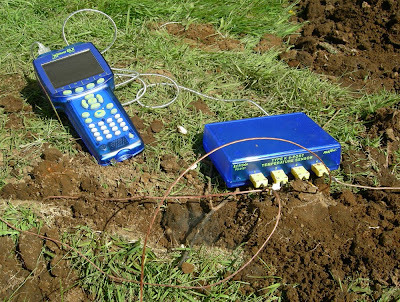 quake) when the area resides on clay ground. Paints also rely on this phenomenon: they are runny when brushed or rolled, but become viscous as soon as the pressure is removed, and thus don't run down the wall. Following Peter Barham's idea, I had another look in Beckett's "Science of chocolate", which confirmed that chocolate is shear thinning (I suspect that Barham indeed refers to Beckett). In addition, when the softened chocolate firms up again, after just a few seconds, it recrystallises in the same crystal form as before. This is important, because heating-cooling sequences (such as when melting melting) might lead to blooming, such as fat bloom. My idea was hence: is it possible to use this property to shape chocolate and still avoid the need for apparently laborious and complicated tempering? Coarse or fine mincing screens? The coarse screen (8 mm holes) was the only one that worked in my hands, as the finer ones resulted in too much resistance. Too much resistance results in clogging and eventually warming/melting the chocolate. Our Kenwood Major (800 W) did the job, but I felt that I overloaded it slightly, especially when it clogged. Dark chocolate is really hard stuff. It'd been fun having some professional extrusion equipment with enough power and temperature regulation allowing to make various shapes. Barham mentions using a pasta machine for "shear shaping" chocolate, but I doubt it'll be strong enough to shape the chocolate, rather than crumble it. Maybe it'll work with milk chocolate? Barham: "The science of cooking"
Beckett: "The science of chocolate"
As this year's Easter greeting, Deptartment of Chemistry at the University of Oslo has developed an egg cooking calculator with reference to Martin's Khymos and my Maturfag ("Norwegian fooducation"). 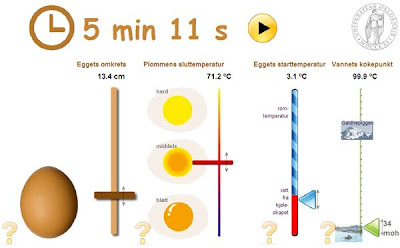 The issue of cooking the perfectly boiled egg has been discussed several places, amongst others on Khymos, fooducation, and on "Maturfag" which is fooducation's teacher resource pages at the Norwegian Centre for Science Education (Google translation of the resource pages here). Also, Douglas Baldwin's Practical guide to sous vide cooking has an excellent section on controlled-temperature cooking of eggs. Tip: For measuring the circumference of the egg, use a piece of string and measure the length that goes around the "belly" of the egg. The ingredients to match in round no. 15 of "They go really well together" are cold smoked salmon and dark chocolate, and the round is hosted by Mex Mix. I thought I'd give it a go, and ended up with smoked salmon-goat's cheese-chocolate ganache-tortilla roll-ups/wraps. I've attended "They go really well together" a few times now, and a description of what this flavour pairing relay is really about is given in the previous posts. 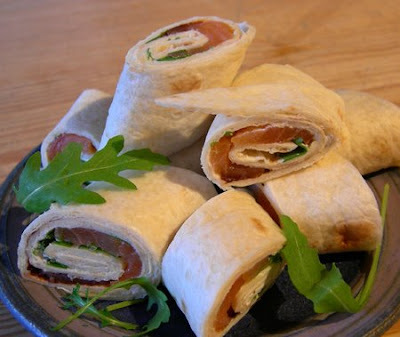 Cold smoked salmon wraps are quite popular starter or hors d'oeuvres in Norway, and is commonly made with spreadable goat's cheese. I thought this simple dish with its rather uncomplicated flavour might serve as a good basis for evaluating the salmon-chocolate combination. I wanted the chocolate to be spreadable and therefore made some ganache. Some of the salmon here in Norway is made using juniper-flavoured smoke. Even though I could not find any match between smoked salmon and juniper berries on the foodpairing web site, this is an "accepted good combination". So I thought using juniper-flavoured cheese and chocolate might add a nice touch (although juniper berries of course are not equal to juniper smoke). The double cream was heated to the boil, the juniper berries were added and let to infuse for a couple of minutes. Chopped chocolate was added while stirring until fully melted. Left to cool, first in room temperature and then in the fridge for 1-2 hrs. The salmon was sliced thinly and brushed with gin and left in the fridge for 3-4 hrs (this made no noticeable difference, save your gin). Goat's cheese, ganache, salmon slices and rocket was spread on the tortilla. The tortillas were rolled and served with either balsamic vinegar or lemon juice for some acidity. For cheese, I tried two different flavoured varieties: dill and juniper. Both worked, but I'd say that dill was a notch better, as juniper flavoured cheese together with juniper flavoured ganache and rocked gave a slightly too bitter overall experience. There was no real crash in this dish. However, the salmon and chocolate didn't go up into a higher unity either. The roll-ups do just as well without the chocolate, and in my opinion this means that the chocolate is redundant. The juniper in the ganache was ok, adding a slight bitterness together with the rocket. 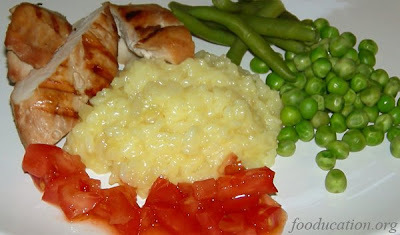 The acid (balsamic vinegar or lemon juice on the side) was necessary to balance the flavours. Two different cheese-to-ganache ratios were tested, depending on the area covered by cheese/ganache on the tortilla. Ca. 60:40 cheese:ganache resulted in the chocolate flavour dominating the cheese (but not the salmon). Using less ganache (ca. 80:20 cheese:choc) resulted in just a hint of chocolate. 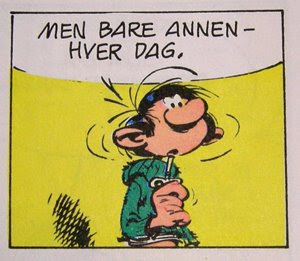 when first seeing this month's combination, my thoughts went to the wonderful comic character Gaston Lagaffe created by ingenious Belgian André Franquin (in Norway, Gaston goes by the name Viggo). Among Gaston's numerous distinctive features is his inherent need for experimenting with explosives and food, and often you wouldn't notice the difference. His favourite office-made dish is chocolate glazed herring (fresh or as kippers). To most of Gaston's readers, this probably sounds like a horrific combination, and I guess that was Franquin's motive. Such an irony then, that Franquin's countrymen at foodpairing.be now indicate that sardines and cocoa/chocolate might indeed be a good match! Facsimile from a Norwegian Gaston album. Copyright probably the publisher Semic (Egmont), but believed being covered by fair use. Yes, I know. I'm six years late to be among the cool guys, but who cares? To me it's all about having fun and learning, and then being late is no issue. As far as I know, spherification and it's related methods were introduced by El Bulli chef Ferran Adrià et al. some time after the turn of century. I has got a lot of attention, and a You Tube search on the term gives quite a few hits on demonstrations of DIY spherification. The phenomenon is based on using hydrocolloids, that is compounds that can generate gels, mostly with water but other media are also know (oils and alcohol mixtures, that is). 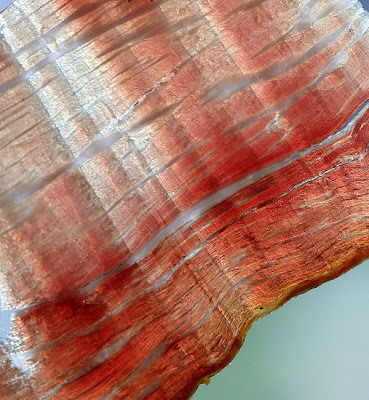 A good place to start is Martin Lersch's hydrocolloid recipe collection "Texture". A number of different gelling agents are being used, the most common household substances being gelatin and fruit pectin, the latter often used when making jams and jellies. In this case I got my hands on some sodium alginate that I wanted to play with. When a mixture containing sodium alginate comes in contact with a calcium solution, the alginate starts to cross-link and a gel is formed. In this case, dripping a alginate-containing solution into calcium chloride generates small beads that are gelatinous on the surface and liquid in the centre. Alginate is somewhat sensitive to the pH, and sodium citrate might be used as a buffer to stabilise the pH at ca. 4-5 (all this information is found in the Textures recipe collection). Sodium alginate is a polymeric carbohydrate-like compound which is soluble in water. 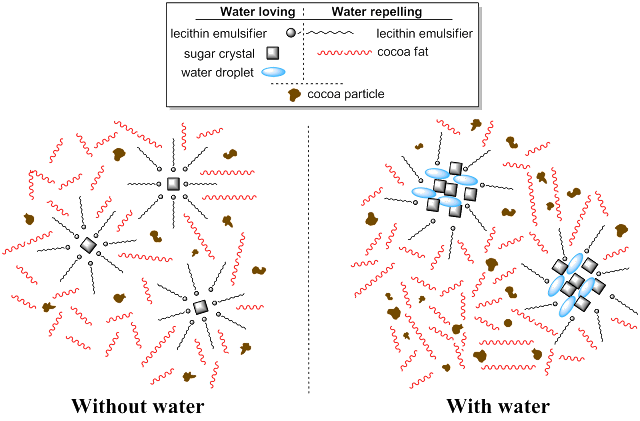 When it reacts with calcium ions, cross-links are formed giving large three dimensional webs that become viscous/gel-like and holds water. For template, the recipe for Melon cantaloupe caviar taken from El Bulli's texturas recipes: The strawberries were blended and mixed with the sugar. pH measured to be ca. 3 (somewhat uncertain since the berries gave some colour to the strips). Sodium citrate was added gradually, stopping at a total of 2 g to get a pH of ca. 4-5.1 Sodium alginate was added and blended (the alginate partially turned into lumps; should have added the alginate to a small portion, mixed this, and then added the rest. Lots of blending did the trick). The mixture was strained through a sieve. For easier dripping (see below), the mixture was diluted 1:1 with water (the initial strawberry mixture was rather viscous, resulting in oblong or drop-shaped "caviars"). This would of course affect gelation, hence the amounts here are deduced on a try-and-fail basis. Calcium chloride was dissolved in the water. The strawberry mixture was dripped into the calcium chloride solution, the drops forming small strawberry beads, and left for 1/2 to 1 minute.3 The beads were strained, rinsed in water and added to the sparkling wine or cider. 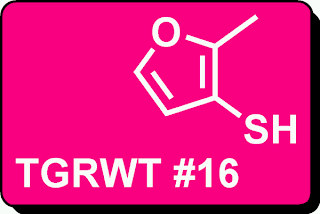 (Tri)sodium citrate functions as a buffer due to its three carboxylic acid functional groups. The strawberry beads/spheres/caviars tasted good, no detectable flavour from the matrix. Simply strawberry. While mixing, the strawberries turned somewhat greyish. Not surprising, since the colour is an anthocyanin pigment (anthocyanin colours are pH dependent, often bright red in acidic environment and more on the green/blue side in basic conditions). The reason for using Chardonnay was simply that I found Chardonnay to match well with strawberries at the food pairing database, and that this might be a fun aperitif (although I would maybe not spend money on an expensive wine and then put strawberry in it). The procedure is somewhat complicated, and I'm glad I didn't bring the kids the first time. When the table was set, and the solutions were ready, the kids loved dripping the solution making beads. Now I've got some experience, and next time I'll bring them along from the beginning. 1 It was difficult to assess the pH correctly, and the amounts of sodium citrate suggested in the textures recipe collection did not (seemingly) have the desired effect. Hence, citrate was added until the desired pH, adding up to 2 g.
2 The CaCl2 must be dry/dehydrated. In my case, it had absorbed moisture from the air and gone all wet (quite hygroscopic). It was in left in shallow bowls in the oven at 150-200 °C stirring occasionally. A couple of hours later, a white crystalline/powdery salt was left. 3 Using 2.5 g CaCl2 per 500 ml water and leaving the beads 30 seconds in the bath resulted in rather soft beads. Leaving them for one minute gave beads that were solid almost throughout. I wanted firmer beads with a soft interior. Increasing the concentration to 4 g CaCl2 per 500 ml water did the trick: firm shell, and liquid interior when the beads were left in the bath for somewhat less than a minute. Has the term "Molecular gastronomy" lost it's content? The term Molecular gastronomy has been debated quite heavily the few last years, and several prominent chefs and writers have denounced the term. What's in a name? An interesting post on the development and applications of molecular gastronomy (MG), both as a term, but also as a phenomenon at Martin's khymos. Most of the relevant links are found in that post as well. Also, many of the comments are relevant and interesting, making the post more complete. Has MG reached a point of matureness in the sense that it might have some real impact on peoples cooking in general? As mentioned in Martin's post, it has already to a certain extent, such as sous-vide cooking. However, some of the more spectacular applications (foams, alginate spheres etc.) combined with misuse of the term in media has resulted in the term being discredited. In my opinion, the name is not the main thing (although its ok to avoid misunderstandings and establish a common ground languagewise as well). I'll continue using the term until a better alternative gets the main foothold. Among the more recent and interesting examples is the 2007 Mottram et al. (incl. Heston Blumenthal) article on tomato pulp being more rich on umami taste than the flesh (short RSC chemistryworld article free of charge). When dealing with tomatoes, many cookbooks and recipes tell you to remove the pulp and use the flesh of the tomato only. However, Mottram's results indicate that the pulp and seeds carry lots of wonderful umami taste, and hence it'd be a shame to throw that away. Heston Blumenthal demonstrates this in one of his BBC In search of perfection episodes, more specifically making tomato sauce in "The perfect hamburger" episode. Also, tomato sauce figures among the freely available Blumenthal BBC videos. Many cookbook recipes might be rewritten just slightly to incorporate this knowledge, giving more flavourful dishes. Furthermore, this knowledge is something that the domestic cook might adopt rather easily. I'd be really happy to see something like this making it into the domestic kitchens around. In that case, MG (or whatever one prefers to call it) does indeed have had an impact. Kroger, M: "Editorial: What's All This We Hear about Molecular Gastronomy? ", Comprehensive Reviews in Food Science and Food Safety, 2006, 5, 48 - 50. This, H. :"Molecular gastronomy", Angewandte Chemie, 2002, 41, 83-88. 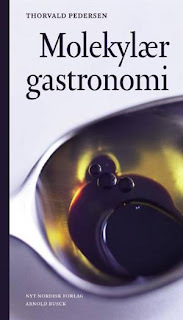 Thorvald Pedersen's recent book: "Molekylær gastronomi"
Thorvald Pedersen has been writing about food and cooking from a scientific perspective for years (mostly in Danish as far as I know), probably well before the term molecular gastronomy gained much attention. Pedersen: "The science of choosing, preparing and eating good food"
This: "The scientific discipline that looks for the mechanisms of culinary transformations and processes, from a chemical and physical point of view"
McGee (1 and 2): "The scientific study of deliciousness"
This debate has been running on the MG mailing list also, by the way. Anyhow, the book has been out for a few months and I got it for present. I've always loved reading Pedersen because he's got this way of making everything warm and cosy, very Danish in a way (Danes seem to be far more relaxed and life-enjoying than us Norwegians, or Swedes for that sake). Reading his books and articles are almost like having one's grandfather telling stories. For that reason, I think Pedersen is even more enjoyable to read than This and McGee language-wise. He seems more relaxed somehow, maybe because he has nothing to prove, being a professor emeritus in chemistry. The book is shorter than his previous books "Kemikeren i køkkenet" (Chemist in the Kitchen), a collection of his articles in the Danish magazine Dansk Kemi (Danish Chemistry) and "Kemien bag gastronomien" (The Chemistry Behind the Gastronomy) which is more of a textbook in food/cooking science or molecular gastronomy. Also, the book is scattered with 27 small boxes on various themes such as plant cell structure, starch, how to identify fresh fish, colours in food, viscosity etc. In terms of what he writes, most of the results refer to McGee and a few other sources, including his regular food column in Dansk Kemi (the Danish research on gourmet salting for juicy and tender meat is especially interesting, and I've planned to write a post on this). Hence, if you've read McGee, there are not many new astounding discoveries. One interesting thing is how he uses the tables of nutrients given the various foods. Most commonly people use such tables looking for amount of sugar, fat, whether a food contains gluten etc., that is health purposes. Pedersen however, uses this information for cooking purposes, and he gives the relative amounts of nutrients by dry weight as well. This is really useful, because various foods are easier to compare. One example is looking for amount of starch in different sorts of potatoes, which might have different percentage amount of water. Given values by dry weight makes it much easier to compare (there seems to be something wrong in the potato tables however, as the amount of nutrients add up to more than 100%). In my opinion, the book is worth buying just for the sheer enjoyment of reading it. Also, I warmly recommend his food column "Kemikeren i køkkenet" in Dansk Kemi, mentioned above, freely downloadable (single pdf files). Matmolekyler published last month an incredibly easy and straightforward experiment for illustrating the phenomenon of odour adaptation. Adaptation is the phenomenon in which you stop noticing an odour/aroma when you've been subjected to it for a while. This is, amongst other, used as a motive for varying aroma components throughout a meal. Have a look at "Jullovsexperiment: Hacka ditt luktsinne" (Google translated version: "Christmas holiday experiment: Hack your sense of smell"). In this case, Malin Sandström, proposes to use coffee and cinnamon. I'm on constant search for experiments that give personal experiences with food and science. In my eyes, the sheer ease of this experiment is maybe the greatest advantage, making it very acessable for anyone wanting to experiment with these phenomena. "Our brains, it seems, respond much more to changes in which molecules are in the nose and mouth than they do to what is actually there, for example - if you chew a piece of gum, the flavour will disappear after a few minutes, as your brain gets "bored" by the aroma in the nose - but there is virtually no reduction in the amount of flavour molecules in the nose. However, if you simply change the input from your tongue, by, for example - taking a sip of sweetened water - the full flavour will be instantly restored"